Blazer ammo from CCI is intended for inexpensive range and target use, and is available with either an aluminum or brass case. 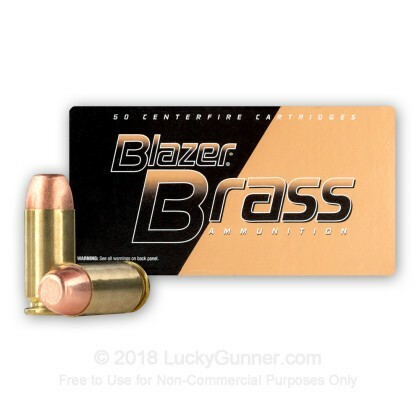 Both types are great for the range, but if you reload or have any guns prone to reliability issues, then Blazer Brass is the better option. All Blazer ammo is made at the same facility in Idaho where Spear, Gold Dot and other high quality CCI products are produced. For this review, we shot a couple of boxes of Blazer Brass 180 grain in a 40 Smith & Wesson. Accuracy was not bad for a budget range ammo. You can see that from our ten shot group that we fired from the bench at 15 yards, using a Sig P226. The ammo ran great through all of our test guns, and we got so bored waiting for a malfunction to happen, we had to execute a few evil ginger ale cans that had invaded the shooting range. As you can see, the Blazer Brass ammo was more than adequate for this task. The shells from Blazer Brass have typically worked really well on my reloading press, and on top of that it's reasonably accurate and very dependable. For those reasons, I have no problem recommending Blazer Brass for any range or training application. Not bad at all. 999 of 1000 fired, perfectly normal. I previously bought the 40 S&W 180 grain Federal American Eagle. This time I went with the Blazer Brass in the same caliber and weight. I found that the accuracy was about the same. When it came down to cleaning my pistol I found that it was a lot cleaner then the American Eagle ammo. This is a plus in my book. The price I got for 1000 rounds was exceptional and would consider buying it again. Excellent ammo for the price. I am still trying other ammo brands to see which works best. My order arrived 3 days from date of order. Great customer service again. I will definitely will be buying from you guys again. Great range ammo, great price. Fired 500 of these through my glock 23. No Jams, maybe a handful of stovepipes. I'm not an expert marksman but the grouping seems good to me. I'll be buying these again. No issues and feed through my Glock like water. As usual best shipping I've ever had. Product view!! I shot 50 rounds of Whinchester with no jams!! However, the first 25 rounds of Blazer flat points produced 2 jams!! With that in mind, I shot the next 50 rounds with no problems!! Haven't been back to range since!! I think that part of the jam problem may have been in the magazine!! I believe all will be well!! Never disappointed, good quality,reliability,customer interaction. Delivery was fast. Ammo shot as good as any other I've used. Accurate, reliable, fairly clean. Had no issues with the first 250 rounds of the 1000 round shipment. I'd but it again from LuckyGunner. Service was great. No issues on shipment, merchandise, or payment. Wlli buy again. I recommend it. This is great ammo to train with and has similar ballistics to the JHP that I carry. Not the cleanest ammo, but there are a lot worse out there as well. Every once in a while I get a cartridge that is missing a primer or the bullet is pushed too far in, but that is like 1 in 1,000...literally. 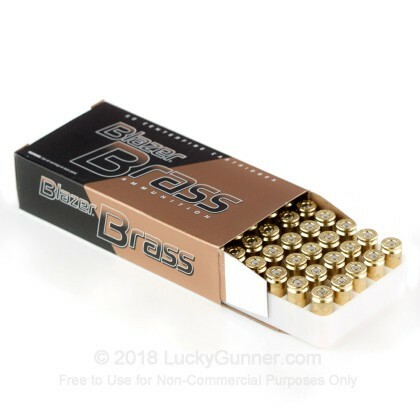 But I will take the price for a full case of Blazer Brass from Lucky Gunner over another competitor with much higher prices and marginally better quality control. Great bargain for the price and I will continue to buy from Lucky Gunner. Not the cleanest to shoot, but not the worst either. Good reliable performance. Ordered early in the week and the ammo arrived a few days later. Excellent delivery service and no issues with the order. Price was good but as always could always be a little better :-). Will definitely order again. No problems with shipping, either! Never a problem with this ammo so far. Can't beat the price! And I have brass to reload! Arrived quick. Ammo is great for the range. We shot 300 threw various guns no issues. Not dirty, will buy again. These rounds performed as well as any other manufacturer of used. Exceptional value and a fine tuned round.....just what I was looking for. Received ammo same week I ordered....even on Thanksgiving week! Great Service! Great looking product. Haven't had opportunity to shoot yet, but don't envision any problems. Keep up the good word, LG! Shipped in 2 days, well packaged and exactly what I ordered. Never purchased online before, but will certainly buy from LG again. Great range ammo at a great price. But I find this brand is very dirty. Gun was nasty after about 150 rounds. Dirty as hell. I've only ever seen a gun this dirty after 50 rounds after shooting wolf. Prepare to clean. Other than that it shoots straight gives decent groups. I will likely keep looking for a different bulk ammo for now though. This is my favorite place to buy ammo. That being said my Glock 23 loves this ammo as well never had one problem with this ammo. I've used quite a bit and I tack drive at 10-15 yards and I group about a baseball at 25 yards. Great ammo accurate and not as dirty. Great ammo! 1 jam with my .40 M&P c. Will buy them again. Lucky Gunner shipped next day, un like the competition who ships whenever they feel like it. Get your 5.56 prices down and I buy more from you. I have shot several hundred rounds of this ammo and had 0 problems in my Glock 23. As always, LuckyGunner has great prices, great service and easy to use website. The price and reliability of this ammo makes it great for competitions. I have shot seven Steel matches with it and have had zero problems! My Glock loves it, and it is clean. Some have mentioned it is dirty, but I have not experienced that. The very expensive ammo we use for our duty guns is far dirtier than this. I love this ammo in my .40 Springfield XD. Shoots smooth and not to dirty.. No jams....I'll be buying this for a long time.. 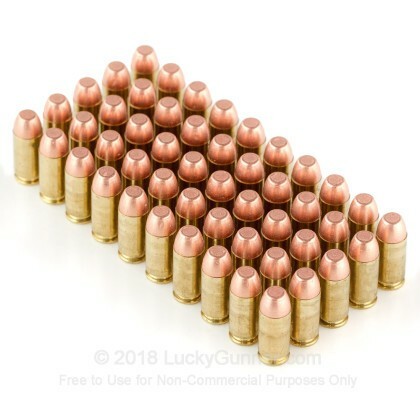 I shot over 500 rounds out of the 1000 I bought and not one issuse.. Great prices and fast delivery.. Cant ask for more... 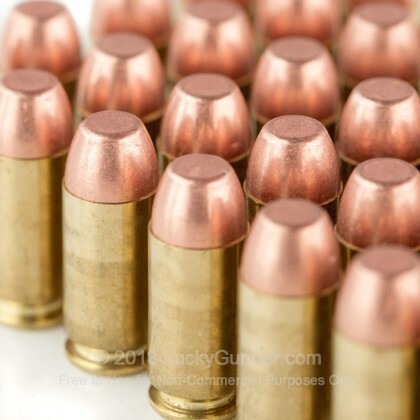 I found a new place to order from and will continue to get my ammo from lucky gunner.com.. The service is great. The ammo arrived in four days. I shot about 350 rounds so far and for the price its good target ammo. I will purchase this ammo again. 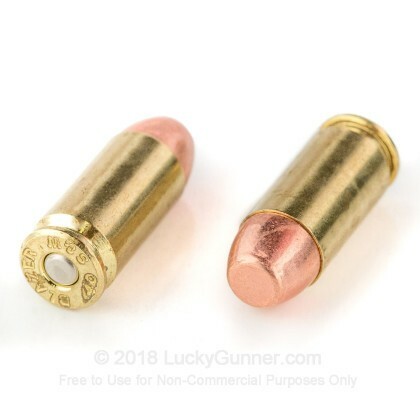 I would recommend LUCKY GUNNER for your ammo. I've fired 500 rounds so far and not one issue. I'll purchase these again when the time comes. Besides the ammunition, the customer service at Lucky Gunner is fantastic and I'll be using them again for my next purchases. 200 rounds through a 40 cal M&P. No jams. Pretty dirty so far. Other than being on the dirty side it is good range ammo. I have literally shot thousands of rounds of this ammo and never had a single problem - ever. Q: Does this ammo contain any steel in the casing or jacket? A: This product is a lead core and copper jacket, it is also brass cased. No steel. Q: Is this ammo compatible with a ported barrel? 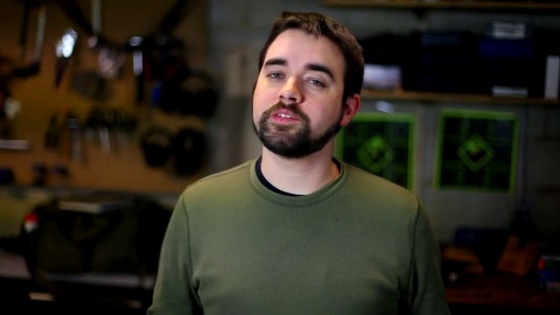 A: Hello John, This ammunition is loaded with a plated bullet and is not recommend for use in a ported barrel. A: Hello Stu! 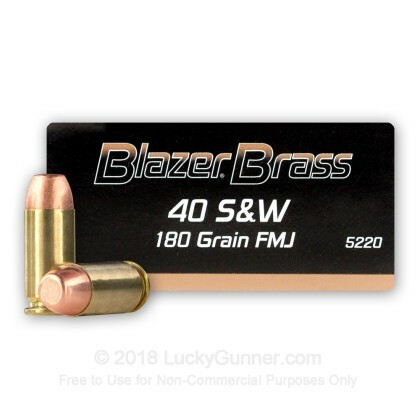 The Blazer Brass .40 SW is loaded with noncorrosive powders and primers! We also have this 40 S&W - 180 Grain FMJ - Blazer Brass - 50 Rounds ammo in stock in a smaller quantity.